BMC (Nuffield Group) News Exchange magazine from 1963 and 1964. Homepage. This page: More 1960's BMC magazines, these the work of The Nuffield Press Ltd of Cowley. The SU Carburetter Company Ltd. The MG Car Company Ltd.
Nuffield Tools and Gauges Ltd.
Also: Morris Motors assembly subsidiaries in Canada, Rhodesia, Northern Rhodesia, South Africa and Australia, plus countless distributors. Naturally, given that it was the 1960s, glamorous young ladies adorn a number of the covers. I doubt Ms Greer would have approved. The six copies I have are dated 1963 and 1964, there are no Volume numbers or Issue numbers given, so when the magazine was introduced, or when it ran until, I cannot say. I've seen scans of copies dating back to 1951, when it was published on a monthly rather than bi-monthly basis, so it pre-dates the formation of BMC (British Motor Corporation) at the very least. My guess is that it ran until the formation of British Leyland Motor Corporation Ltd (BLMC) in 1968. My copies feature the following cars on their covers: Morris Oxford taxi (July/August 1963), Riley 4/72 (September/October 1963), MGB (January/February 1964), Morris Mini (March/April 1964), MG 1100 (July/August 1964), and the Morris 1100 (November/December 1964). News Exchange was distributed to dealers situated in the overseas export markets where the Nuffield Group companies were active, and naturally focuses on Morris / MG / Wolseley / Riley cars rather than anything with an Austin badge screwed onto it. Brand loyalty was still a big deal in those days. News regarding the day-to-day operations at Cowley commence the information relayed via each magazine, this might include new appointments within the Group, advice of new promotions (for instance, New Zealand-based dealers were promoting the Morris 1100 under the headline "No rock! No roll! No twist! No bounce! in 1963), notable anniversaries (Boon and Porter Ltd, Riley dealers in London, were celebrating their 70th birthday in 1963), in addition to interesting fleet purchases (an example being five brand new Morris Minivans sold by Nuffield's distributor in Lagos, to local brewery Star, a photo of which is shown below - the roof boards read "Ah! Star"). Do any of these Star brewery Mini vans survive in Nigeria? Whenever a famous face knowingly purchased one of the organization's vehicles, Nuffield photographers were keen to get a snap of the keys being handed over. Actors, distinguished military or political persons, or sporting personalities were all fair game. Police forces dotted around the globe were also regularly to be seen in Morris, Wolseley etc dealerships. The July/August 1964 issue for instance contains a photo of New South Wales policemen, stood alongside part of an order totalling 215 Morris 850cc Minis, due to be delivered by Sydney distributor Lancaster Motors Pty. Ltd. The January/February issue features three members of Bath City Police Force, stood with three new Wolseley 6/110 Automatic Saloons, outside the premises of Bath Garages Ltd. Each was fitted with a blue roof lamp, plus a bell and siren fitted to their front bumpers, no doubt soon becoming a regular "threat" in the rear view mirrors of hastily-driven Mk2 Jaguars across the city in the 1960s. Do any of these 6/110s, registrations OGL 231, OGL 252 or OGL 273 survive? This section of each issue highlighted some of the events that had recently taken place at Morris (etc) garages. The November/December 1964 issue recalls one lucky chap, by the name of Alasdair Ross, winning a brand new Mini Cooper S from dealer A. & D. Fraser of Glasgow. Not only did he win a brand new Mini, the keys were passed over to him by racing driver Jim Clark no less. 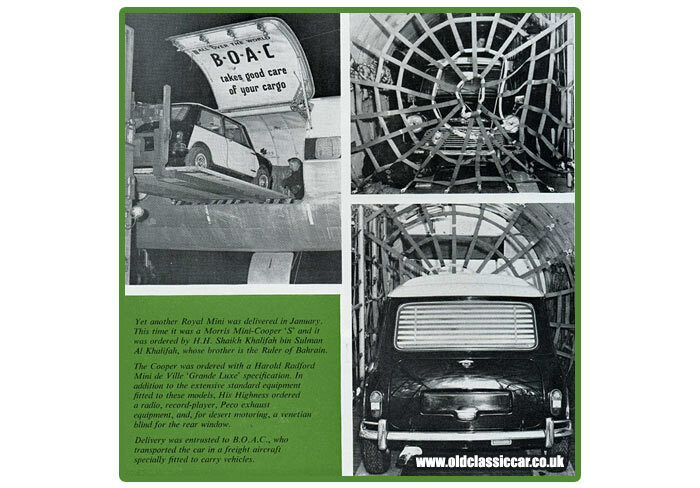 The same issue also celebrated the 10,000th vehicle to be completed at the South Rhodesia BMC plant in Umtali, a photograph accompanies the news item with beaming workers stood next to the shiny Morris 1100 as it prepares to leave the assembly line. Each magazine is packed with stories about the cars, the people that worked in the company both in the UK and overseas, plus the histories of some of the leading dealerships. Commercial vehicles, including tractors, also receive their share of the limelight. 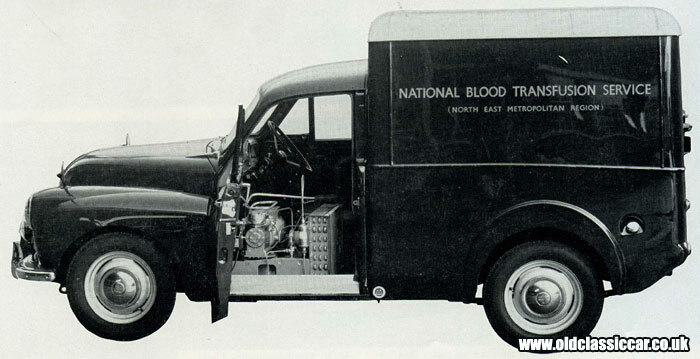 One interesting pairing comprises a 3-ton Morris FG lorry, and a 6-cwt (Minor) van, both in use with the National Blood Transfusion Service in the Brentwood area. The FG was used as a mobile blood collection unit, fitted with bodywork by Cunard, and visited church halls, factories, and other key buildings in the area to collect blood. A fleet of 6-cwt vans distributed the supplies to local hospitals in the area, one of which is portrayed in the article. Many of the articles relate to fairly mainstream models, but every now and then there is something more obscure to read about. 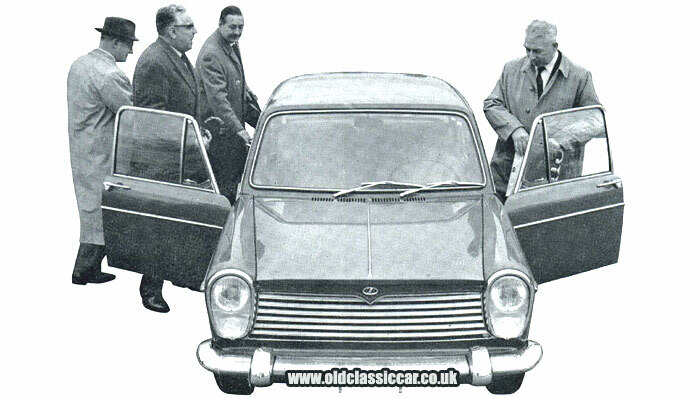 The Innocenti IM3 was the Italian-built version of the Morris 1100, and this interesting variation on the ADO16 theme gets a mention in the September/October 1963 issue. Featuring revised styling designed to appeal to Italian motorists, the IM3 is shown at a publicity event in the country. The different lamp arrangements, grille, and Farina-esque bumpers, can clearly be seen. Radford Mini de Ville "Grande Luxe". In March/April 1964 Nuffield/BMC dealers around the globe would be introduced to a smart new Morris Mini Cooper S, incorporating the Harold Radford conversion to Mini de Ville "Grande Luxe" specification, that had been ordered by H.H. Shaikh Khalifah bin Sulman Al Khalifah, the then brother to the Ruler of Bahrain. In addition to the usual modifications found on Radford Minis, this example also boasted a radio, a record player, Peco exhaust system and a venetian blind in the rear window, to make desert driving more bearable. The one-page article shows the Mini, not dissimilar to the Radford Mini on this page of the vintage photo gallery, being loaded onto a BOAC aircraft, probably a Comet. Another interesting article, to be found in the January/February 1964 edition, concerns a 1956 Riley Pathfinder that belonged to a gent who lived near the Automobile Palace BMC dealership in Llandrindod Wells. He planned to complete a 7,000 mile journey to the Middle East, and approached the firm for sponsorship. Automobile Palace serviced the eight-year-old Riley, and supplied a set of spare parts and route advice. The trip went with barely a hitch, only two punctures and a broken fan belt slowing Mr D. Davies' exceptional road trip. Although looking a little travel-worn after its adventures, the Pathfinder - often nicknamed the Ditchfinder by cynical types in the day - had returned home in admirable condition, bar numerous stonechips and the odd ding. So impressed were the garage with the Riley's performance, they displayed it in its muddied state, alongside a map of the route, and a selection of new Rileys for company, in their showroom. The promotion led to the sale of several new cars, so was a success for all parties, the report suggests. There were many more interesting tales that could have been repeated from the six magazines I have. For instance I've not touched on the many motorsport-related triumphs that the firm enjoyed, especially with the Mini rally cars, campaigned not just by the Works teams but also in private hands. I find these old car magazines fascinating to read, and they're well worth tracking down if the products of Nuffield and BMC in general during the 1960s are of interest. The sectioned Wolseley 6/110 Mark 2 was photographed at the 1964 Motor Show at Earls Court. Return to the car magazines section. Another title produced by the Nuffield Organization in the 1960s was Motoring, which is also covered on this site. By the end of the 1960s, the new High Road magazine - a BLMC group title - replaced the many, many different magazines that had been published during the BMC days.